Last month I wrote about my wonderful residency at VCCA-France in Auvillar. 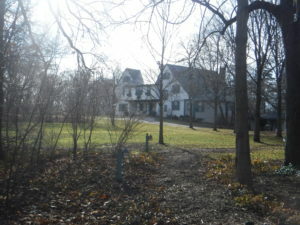 After I had scheduled that residency, I was awarded a residency at the Ragdale Foundation in Lake Forest, Illinois, with only a couple of weeks in between the two. I don’t usually do two long trips so close together, but I didn’t have a lot of options, so here I am. I’ve been to Ragdale before. I had a very productive stay here in 2014 and I’ve wanted to come back. And frankly, the timing worked out better than I thought it would as I’ve been able to continue the momentum I had at the residency in France. I think I’m getting a lot of good work done. 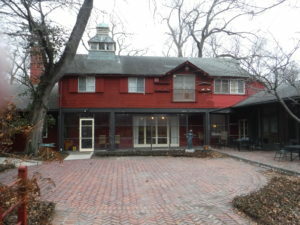 Five artists in mixed genres stay in the Barn House, which is a charming building that also houses the kitchen, dining room, offices and conference room. I’m in the Barn House this time along with two other writers, a painter, and a composer (who is working in a separate building on the prairie called the Meadow Studio). The last two artists—during this session a dancer and a mixed-media artist—are in a 2-unit building called the Friends Studio. Ragdale has fixed sessions, so that everyone is together for a specified number of weeks, allowing us all to get to know each other well. And although we live in different buildings, we have a communal dinner (prepared by Ragdale’s amazing Chef Linda) five nights a week. The rest of the time, we’re squirreled away in our studios—for most of us our bedrooms double as our workspace—focused on our projects. For me, that means getting up reasonably early, having breakfast, and then sitting down at the writing desk until a lunch break. I work most of the afternoon, although I like to go for a walk (weather permitting) at some point before dark. 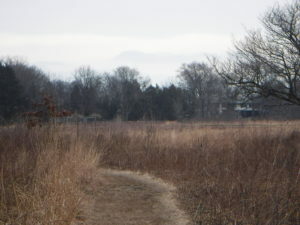 I either walk into the village of Lake Forest, with its tony shops, or on trails through the prairie and nature preserve. After dinner, most of us return to work. My goal for this residency was to come close to finishing a draft of the novel I’m working on that addresses two significant plot problems I had identified. I believe I know how I’m going to deal with those problems, but I can’t declare success until I’ve actually written those solutions into the draft. I’m grateful to the Ragdale Foundation for providing the time and space to do this work and for creating a comfortable and supportive atmosphere in which to create.